The genesis of hot air balloons goes back to France in the XVIII century, when the Montgolfier brothers had their first flight in Annonay. I was lucky enough to experience such a flight in Kandalama in the Sri Lankan cultural triangle. We left the hotel at dawn at 4.30AM as our take off was scheduled at 5.45AM, right before sunrise. We were 8 passengers, 2 in each corner of the magnificent wicker basket. The pilot welcomed us warmly with a big smile. He said, “Welcome on board. Please bear in mind that you are not allowed to leave the basket unless I order you to do so! 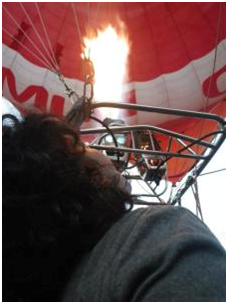 The flames gushed up in the air and the balloon started swelling. 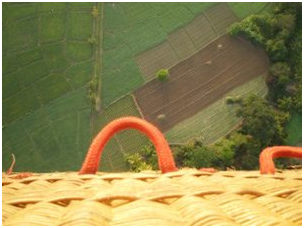 Soon the basket left the ground and we all found ourselves in the air!! The paddy fields and trees started looking more and more distant as we kept rising. The view mingled with a bit of fog due to this early hour of the day, it surely was a splendid sight! The pilot mentioned that we were above 600m in height. The sight of the famous Sigiriya Lion Rock was brilliant! We could spot the Polonnaruwa statues as well as the huge golden Buddha statue of Dambulla. We started snapping pictures like maniacs as we flew. Around 7.30AM we stared our descent back to land, where we were welcomed by a bunch of local children who gathered around the balloon with great joy and laughter. 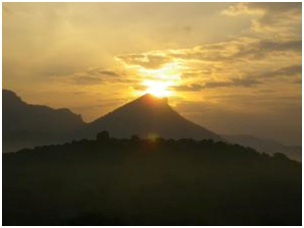 Shanti Travel organizes hot air balloon rides and customized tours to Sri Lanka. Contact Shanti Travel to design the trip of your dreams.